With the departures of fifth-year senior receivers Parris Campbell, Terry McLaurin, and Johnnie Dixon, the Buckeyes must replace a trio of receivers that accounted for a total of 167 receptions, 2,433 yards, and 31 touchdown catches in 2018. Despite the losses, Ohio State will return six receivers with extensive playing time in Austin Mack, Binjimen Victor, KJ Hill, Chris Olave, CJ Saunders, and Demario McCall. Those six players combined for 146 receptions this past season, and that’s with Mack missing six games due to injury and Olave and McCall not really coming on until the end of the season. There are also redshirt freshmen and true freshmen coming in, as well as receivers like Jaylen Harris and Ellijah Gardiner who have yet to make an impact. 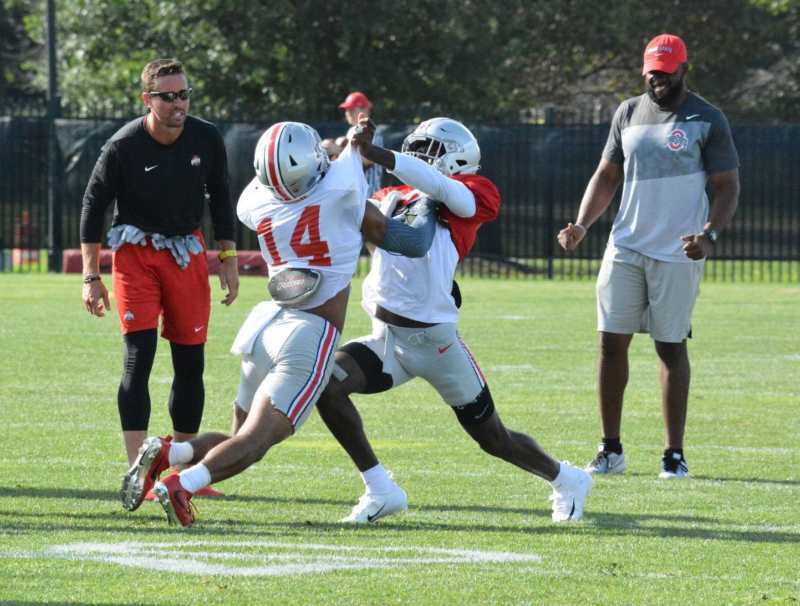 So while the Buckeyes are losing a ton in Campbell, McLaurin, and Dixon, receivers coach Brian Hartline is excited about the players who are returning. There is no reason for Hartline to feel bad about the situation he finds himself in. With Victor and Mack, he is returning a pair of players headed into their third season in the receiver rotation. Victor has caught 11 touchdowns over the past two seasons, and Mack still finished fifth on the team in receptions (26) despite missing the final six games. 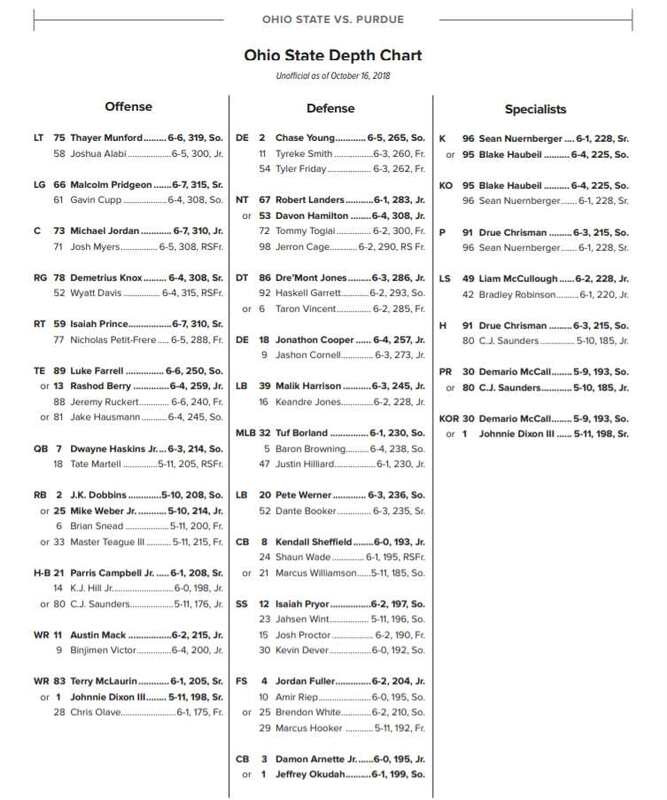 Mack’s departure forced McLaurin to play ‘X’ in Mack’s place, freeing up freshman Chris Olave to finally get some reps, which he capitalized on. And the return of KJ Hill will allow the Buckeye passing offense to have reliable receivers returning at all three spots. Since Hartline came to Ohio State late in the 2016 season, Campbell, McLaurin, and Dixon have been constants in his life. So while he is excited for what is to come at OSU, he is also going to miss the guys he has helped grow so much. The Buckeyes will have four senior receivers in 2019 in Mack, Victor, Hill, and Saunders, but the leadership provided by guys like McLaurin and Campbell has been unique throughout their careers. Early on, strength coach Mickey Marotti pointed them out to Urban Meyer and said they would be leaders in the program. Hill returning tells you he wants to be a leader. Saunders, who began his career as a walk-on cornerback, has his team’s respect. Mack was blossoming last year prior to his injury, and Victor’s last season is expected to be his best. The possibilities are there for the kind of leadership the Buckeyes will need. The other question is will there be the necessary six or seven receivers that can be counted on? Ohio State wants to rotate at least two players at each position, and right now there are a number of jobs up for grabs. In fact, Brian Hartline will tell you that every job is up for grabs because the best players are going to play. Whether or not any of those young players can lay claim to one of those prime spots is still very much up in the air. It will be a daunting task for Hartline to integrate the new leadership while developing the new, young talent to a level where they can contribute as needed. He wouldn’t have it any other way, though. Don’t forget, or sleep on, Jaelen Gill. Just because H is where they put him last year doesn’t mean that’s where he’ll fit best this year. Yeah I know he’s an H Back but you did mention McCall in the same article. Oh what could have been the last 3 years had Urban simply not hired his friends and mentor’s grand kids?! People hire their friends. That’s the way the world works and that’s the way coaching works. It’s always been thus. If Earle Bruce hadn’t hired his friend and former protege Urban Meyer to Colorado State, you wouldn’t even be posting comments about Urban hiring his friends. You wouldn’t know who Urban is. People nowadays just want to latch on to one single solitary minute meaningless detail and blow it all out of proportion. It’s naive to think that nobody hires friends. Nick Saban hires friends (if he has any). Dabo Swinney hires friends. Hank Stram hires friends. Knute Rockne hires friends. Woody Hayes hires friends (who then became mortal enemies). Y’all’s soapbox is crumbling. Please get off before you fall and break something. that’s funny and true Michael! SMART people don’t make a habit of hiring friends, Michael. How many of the folks you named, hired a “friend” who brought disgrace to the program like Z Smith did to OSU? He’s a “friend” who should have been canned a half dozen times before it blew up in Meyer’s face. People can hire friends elsewhere, I’d like my team to be better than that. Gotta agree with Longtime fan. Can you give examples of Saban and Swinney hiring friends? My impression is that they don’t do so, and that they fire quickly if a coach is under performing. Dabo himself was a “friend” hire. He played for Tommy Bowden at Alabama, who then hired him as an assistant at Clemson. Saban has employed Kirby Smart and Jeremy Pruitt (2x) as 2 such examples. As for underperforming, it’s the people commenting in these forums that turn that perception into reality in the first place. We don’t know that the Ohio State linebackers coach was underperforming. All we knew/know was that the scheme wasn’t working and the players were underperforming. And that Schiano was in charge, not Urban’s best man. You same fickle fans were up on the same underperforming soapbox when crying about how horrible Luke Fickell was. It wasn’t until Everett Withers took another job that people began to actually admit that maybe he was the reason and not Fickell that the defense sucked and Urban had to pull a fullback over to LB and teach the defense “leverage” and “angles”. Let’s go one step further: Ryan Day was a friend hire. He played for Chip Kelly at New Hampshire. He then was hired by Chip Kelly to coordinate his offenses in the NFL. Urban Meyer than hired Ryan Day of the recommendation from their mutual FRIEND, the same Chip Kelly, who’s offensive schemes Urban has admitted repeatedly over the years that his scheme is based on. Mickey Marotti: still on staff at TOSU, still a very close and personal friend of Urban Meyer’s. Ed Warriner who coached so many great offensive lines here, was a lifelong friend of Urban’s. Tony Alford coached with Urban at Florida before Meyer brought him to Columbus. Freddy Kitchens up in Cleveland just hired a dozen assistants, nearly all who played in, or coached with Freddy at Arizona. Josh McDaniels is a friend hire. He was OC at Bama for Nick Saban before Saban’s other friend, Bill Belichick hired him up in New England. Everything you said is spot on and that kind of level headed and truthful thinking is unwelcome here!!!! Ah, the Bill Marks seal of approval…case closed. Spot on!!! Tired of keyboard warriors latching on to this “single” objective of hiring friends. Pretty certain Ryan Day just hired a friend. That doesn’t exclude him from being ‘Smart’.